THE text-books of the National Drawing Course are intended particularly for public school teachers ; but this book is written not only for public school teachers, but for all art students and others interested in art education. It supplements the first book of the series (" Free-Hand Drawing "), and shows how the methods explained in it may be applied in the study of lights and shade. Good instruction in drawing must be based upon the principles which underlie the best in art, and therefore any book which is intended for the student and elementary teacher must present these principles, and must also shoW how students may be led to see, think, and work independently. The books " Free-Hand Drawing," Mechanical Drawing," and " Color Study " form a necessary part of the National Drawing Course, as they contain the lessons in these different subjects which are to be given according to the order specified in the teacher's " Outlines of Lessons." " Light and Shade " contains no lessons or other work called for in the plan of study of the present system, for it is not considered wise to attempt light and shade in the public schools until pupils have gained more ability in free-hand drawing than they now generally acquire below the high school. In presenting, in the " Outlines of Lessons," work in outline simply, the author does not wish to be understood as in favor of this work only, or as holding the opinion that light and shade cannot be taught in the public schools with advantage in grades below the high schools. On the contrary, he believes that this subject may under suitable conditions be properly introduced into grammar schools when pupils are able to draw in outline with some degree of facility and truth. This book is written for those who wish to study the first principles of light and shade, and the details concerning mediums, technique, and the many points upon which the student must be informed. It is written with the hope that it may assist students, and particularly those who work at home, to study intelligently, so that all may go to Nature as the first and best teacher, and be prepared to discover in her the truths she unfolds to those who study her seriously. Many of the illustrations of this book are from students' drawings, and though they do not reproduce the drawings perfectly, they give an idea of what may be accomplished by students who are taught to work artistically, and to depend upon themselves and upon study of nature. Figs. 43, 44, and 58 are by second-year students of the Massachusetts Normal Art School ; the other charcoal drawings of Chap. V are by students of the entering class of the same school, as is also Fig. 62. Figs. 63, 64, and 65 are by students of the School of Drawing and Painting of the Museum of Fine Arts, Boston. Such work can seldom be done in the public schools until conditions are very different from those now existing ; but teachers can give instruction of an artistic nature which will be in harmony with the work of the best artists, and which will prepare for work such as that illustrated. Only the essentials can be given in this book. Those who wish to go more deeply into theories and principles will find many interesting books. Among these the works of Joshua Reynolds are particularly valuable, as he is a prominent example of a great artist who has also written upon art, and all art students are advised to study his writings with care. The author desires to express his obligations to Robert W. Vonnoh, G. A. Hill, and Amy Swain, who have kindly read the proof sheets and furnished him with many valuable suggestions. Chiaro-oscura.—The word "chiaro-oscura" means the art of producing the appearance of reality and of solidity by a drawing which represents the different lights and darks seen in nature. Sight due to education. — We see what we have been educated to see. The infant reaches out his hand to grasp the moon, and even to adults appearances are so deceptive that when the moon is rising or the sun is setting, it is difficult often to believe that they are not just beyond some hill in the middle distance, and if the distances were not fixed by science they would be continually under discussion. There is no chance for discussion concerning the facts, but upon questions of art science is of little assistance. Hence different people viewing the same things will give very contradictory reports of what they see, and each will be positive that what he has seen is what all should see and all that can be seen. Sight is imperfect. — Any one will be surprised to discover how little he really sees, even of the objects about him every day, if he will attempt to describe from memory, either by words or by making any kind of a drawing, the facts concerning any building which is seen daily. On comparison of his description or drawing with the building, he will be astonished to discover that he has never really seen the building, for he cannot describe correctly even its principal parts ; and as for details, many of the most important he never sees until he compares the building with his description. Sight due to memory. — The act of seeing depends upon the brain more than upon the eye, for sight sensations are referred by the mind to knowledge previously obtained concerning similar sensations. Seeing is thus largely a matter of memory, and sight sensations are read, not by careful study of the facts of the image in the eye, but by means of the knowledge gained from all sources concerning objects which have occasioned similar sensations. The natural eye is an exact instrument which records truly the apparent form and color of an object. The same images are formed in all normal eyes which view any object from the same position, but these images will be read differently by minds differing in capacity and training ; and of a dozen different people who see the same objects, no two are likely to agree in their description of them. The person who has not studied drawings looks at a circle and sees a circle, regardless of the position of the circle ; he looks at a white object and sees white of one unvarying value ; he looks at a tree and sees green when the eye may record not a single spot of green. The uncultivated eye sees objects in outline and of their local color, and even those of artistic temperament and education require much study to realize that any object of one color appears of very different colors, none of which may be the local color. Objects are seen by contrasts of light and dark. — Objects are seen through the action of light which they reflect to the eye in different degrees and of different colors, and every object appears lighter on one side, darker on the opposite side, and throws a shadow upon some other object. Objects are visible because of contrasts of light and dark, each one appearing either lighter or darker than its surroundings, or appearing lighter than the background in one part and darker in another. If two objects of the same color reflect. light equally to the ey4'they appear of the same value, and if any part of one is in front of the other, its outline in this part cannot be seen. A monochrome. — These contrasts of light, dark, and color may be represented by contrasts of light and dark, using simply one color. Such a drawing or painting is called a monochrome, and may be of any color, though black or some dark neutral color is generally used. A monochrome is a light and shade drawing, whether it is made with oil or water color or colored crayon, and any drawing representing values simply is a light and shade drawing, whether made with the brush, charcoal, crayon, pen and ink, or other medium. All objects in nature are colored, and representing these colors by black and white or by different tones of any one pigment gives a conventional treatment, which, though far superior to outline, may fail in expressing all the facts observed, to do which even color is sometimes insufficient ; but a light and shade drawing is capable of expressing much concerning any object. It is more satisfactory than outline, because the shadow on any object varies with the form of the object, and thus describes it ; and also because the cast shadows vary both with the form of the object which casts them and with that of the object which receives them, so that they describe the forms of both. The shadow and cast shadow will often show facts of form which the outline or contour of the object does not show at all. Effects of different lights. — Objects are seen under very different illuminations ; they may be exposed to direct light, either sunlight, moonlight, or any artificial light, and this light may be strong or weak ; or they may be seen under the diffused light of a gray day, or of a room with shaded windows, or of a starlight night. The direct light may come from one source or from several, and the diffused light may be strong or weak, though to a less extent than direct light. It is evident that the effects produced by these different lights must be so numerous and so varied that to formulate rules for the production of light and shade drawings is impossible. But by study of the effects certain principles may be discovered which will help the student of light and shade just as the study of the principles of free-hand perspective aids in the study of outline drawing. Sphere illustrates all light and shade contrasts. — We will study the effects of sunlight by means of the sphere, which is well adapted to present all the light and shade effects visible in nature. Sunlight effects. — The rays of sunlight are straight, and diverge from the. sun, but in the study of shadows are generally considered as parallel. One half of the surface of the sphere will then receive direct rays of light, and the other half will receive no direct rays. The half which receives the direct rays appears light, and is called the light; that which receives no direct rays appears dark in contrast with the light, and is called the shadow. The light and the shadow are separated by a great circle upon the sphere which is perpendicular to the rays of light. The points in the circumference of, this circle are the points upon the surface of the sphere at which the rays of light are tangent to the sphere. These tangent rays form a ' cylindrical surface which extends below the sphere till it intersects the ground or other surface. The part of this other surface within the cylindrical surface receives no direct light and is called the cast shadow. Any object exposed to direct light has a light side and a shadow side, and throws a cast shadow. Dividing line of light and shade. — The above facts are shown by Figs. i and 2. Fig. r is a side view representing the ground by A B, the highest and lowest rays of light by R and R, the light by L, and the shadow by S. The great circle which separates light from shadow is represented by C D, and is called the dividing line of light and shade. Observation of a white sphere which is exposed to sunlight will make these points plain. But if Fig. i is not understood, let the student roll a sheet of paper into a tube which will just receive a ball or other spherical object. He will find that the cylinder will touch the sphere in a circle which is at right angles to the axis of the cylinder and which appears a straight line when the cylinder is placed as in Fig. 1. Fig. 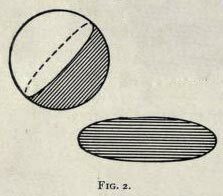 2 represents the sphere when it is below the eye with the ellipse of cast shadow visible, and so that the circle separating light from shadow appears an ellipse. Light and shadow on the moon. — A familiar object which illustrates the appearance of the dividing line of light and shade on the sphere is the moon, of which half the surface is lighted by the sun's rays and the other half is in shadow. The moon is constantly changing its position with reference to the earth and the sun ; hence its circle, which separates light from dark, is being seen at different angles, and the different phases of the moon result. Photographs do not give sharp dividing lines of light and shade. — In Fig. 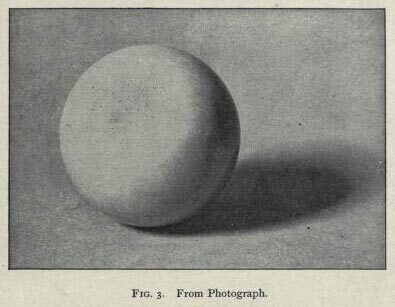 3, which is made from a photograph of a white sphere with a smooth surface, there is no sharp dividing line of light and shade. The light came from a window facing north, and we must now consider the cause for the difference between Figs. 2 and 3. Reflections. — In order to determine this we must remember that light is reflected from any smooth, polished surface such as that of a mirror, so that the angle of incidence is equal to the angle of reflection, and a perfect image of the object is produced. Very little of the light falling on the surface is absorbed by it, and almost all the rays are regularly reflected so that the image is almost as bright as the object. If the mirror is not quite smooth or regular, a distorted image will be produced. and as the roughness of the surface is increased, its power to reflect light decreases ; moreover the light is reflected irregularly, so that no image is produced. Effect depends upon position. — The difference in the appearance of the different parts of the sphere of Fig. 3 is caused entirely by the different positions of the various parts of its surface with reference to the light. The lightest part is not, as is commonly stated, the part which receives the most light, that is, the part at right angles to the direction of the light, but is the part which is situated so as to reflect the light most directly to the eye. The darkest parts of the surface are those which send to the eye none of the direct rays and the fewest rays that strike the surface after being reflected from some other surface. The high light. — The surface of the sphere is continually changing. One point is situated so that it reflects the ray which it receives directly to the eye. This point glitters, and is called the high light or glitter point. Away from this point the rays are reflected less directly toward the eye, and the farther from the high light a point in the light is situated, the farther from the eye it reflects the light it receives. The high light is theoretically a point when seen with one eye and with direct sunlight, and if the sphere is one whose surface is a perfect mirror. With any studio or other light and the usual conditions, the high light is a figure of definite form, which is the reflection of the window or source of light, and within it will be found the image of all the bars which divide the window. If the sphere is not polished, there will be instead of the high light a spot whose size depends upon the size of the window or light, and which is brighter than any other part of the sphere. Hence we have a glitter point or its equivalent on the surface of every sphere. The half light. 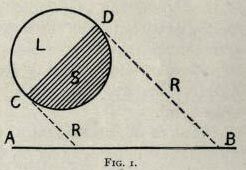 — The points in the circle which separate light from shadow do not reflect any direct rays to the eye, for these rays are tangent to the sphere at these points, which, since they receive no direct light, must appear very dark. From the high light toward these points there is a gradual diminution in the apparent brightness of the sphere, and at these points the light surface ceases. The gradation is very gradual through the larger part of the light, and is most noticeable near the dividing line of light and shade; this last part is called the half light. The reflected light. — The strongest part of the shadow upon the sphere is the circle which separates the light from the shadow. Between this circle and the outline of the sphere a part of the shadow is considerably lighter than the rest of the shadow. This is caused by light which is reflected to the sphere from the object on which it rests or from other objects, and is called reflected light. This reflected light is always present, and the entire shadow part of the sphere which is visible must receive and send to the eye some reflected light ; were this not the case all details of the shadow side would be as invisible as the dark part of the moon. The power of reflected light is shown at the time of new moon when all the surface of the moon is visible ; a small part being brightly illumined by the direct rays of the sun, and the larger part faintly lighted by the rays reflected to it from the earth and then sent back to earth again. If the surface of the sphere is polished and a bright object is placed near the shadow side, it will be reflected bright and sharply defined ; and upon a sphere of polished metal the reflections would be so bright as to destroy the effect of light and shadow. When the surface is not polished or not even smooth, the reflected lights are much weaker and may often be hardly noticed. The cast shadow. — The cast shadow in Fig. 3 is seen to be dark and clearly defined, its outline being sharper near the sphere than farther away. The cast shadow, like the shadow, is darker in parts and lighter in other parts, owing to the unequal amounts of reflected light which these parts receive and then reflect to the eye. Photographs not always true to nature. — Photographs do not give the values and relations which the eye sees, but they often give the principal.effects so nearly as the eye sees them that the student may learn much from them in connection with study of the objects themselves, and thus many of the _illustrations of this book are from photographs. All who study these notes are advised to carefully study similar objects placed so that they are lighted as in the illustrations. The direction of the light and the size of the window from which it comes influence the effect so strongly that several experiments may be necessary to obtain effects similar to those of the figures. Generally three faces of the cube are in light and three in shadow, and six edges separate light from shadow and form the dividing line of light and shade. Fig. 4 represents a white cube placed against a gray background and a piece of charcoal resting against the cube. The light comes from above, behind, and at the left of the spectator. The light. — The front light face is lightest at the front edge and gradually becomes darker as it recedes ; it is lighter than the top face. If the cube is perfectly clean and its faces are equally white, and the light comes from such a direction that the top face and the front face reflect it equally to the eye, these faces will appear equally light, and the edge separating them will be invisible. If the top face reflects more light to the eye than the front face, it will appear the lighter. The shadow. — The shadow side of the cube is darker than the foreground and background, lighter than the cast shadow, and much lighter than the charcoal ; it is darkest at the front edge and gradually becomes lighter as it recedes. It is also darker near the bottom where the dark cast shadow reflects dark. The cast shadow. — The cast shadow is darkest and sharpest nearest the cube. 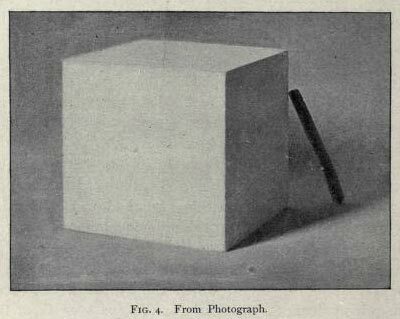 The charcoal seems to cast a shadow within that of the cube; but as the charcoal is wholly within the shadow of the cube and receives no direct rays, it is evident that the darkening of the cast shadow near the charcoal cannot be due to the same cause that occasions the cast shadow of the cube. No object which is in the shadow of another can_ cast a direct shadow, for it receives no direct rays of 1ight.__It does, however, receive indirect rays, and when they are strong an object in the cast shadow, like the charcoal in the present case, may cut off these reflected rays so as to darken the cast shadow near the object, and thus practically produce the effect of a cast shadow. The cast shadow of the cube is darkened in this way in two distinct directions, and variety in the cast shadow is often due to this cause. Light reflects on foreground. — The front face of the cube reflects light to the foreground. If the foreground were smooth, this light would cause a distinct reflection bounded by two vertical lines ; but as the foreground is rough paper, the reflections of the edges of the face are not seen, and the foreground is simply lightened under and near the face.